Stretch marks or striae, as known medically are defined as the line, streaks or marks that get formed on the skin in areas such as abdomen, thighs, chest, upper arms, and buttocks. The risk factors for the formation of stretch marks include females, pregnant women, both boys and girls in teens and people with certain genetic diseases. These marks are initially red or purple in color, but gradually fades to off-white or grey with silvery outline of the stretch marks. Our skin is made up of three layers, one of them is the dermis layer of the skin. The skin consists of collagen fibers, which due to over-stretching of the skin, due to excessive growth of body and hormonal changes get damaged. These elastin fibers, lose their elasticity and get weakened. This lets to deeper skin layers to be visible, and hence blood vessels also become visible, leading to the formation of red stretch marks. However, the appearance of stretch marks depends on various factors like the texture of skin, complexion and for how long they have been and on which area they are being observed. 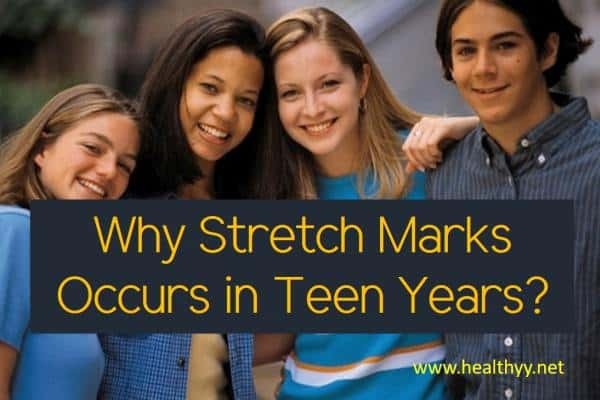 Why do Stretch Marks occur During Teen Years? How to Prevent Teenage Stretch Marks? During puberty, both the boy and a girl grow and gain weight, which is sudden and rapid. This leads to pulling of the skin and the formation of lines on the skin known as the stretch marks. The skin can’t keep up this balance of body growth exceeding more than the skin can expand, which results in red, pink or purple marks in light colored people, whereas in dark complexion people, these lines may be more darker in color. Stretch marks are common during teenage, in both boys and girls. It is estimated that up-to 70 per cent of girls get some sort of stretch marks during their teens. Most teenagers get stretch marks on their breast, hips, and belly- the areas where the growth is really quick. Some girls are more prone to getting off these stretch marks more than others, this is because of their family history and genes that affect how fast your body can grow and how elastic your skin is, which thus affects your tendency of getting stretch marks. It is known that if your sister or mother had stretch marks, you too are prone to get it. Eating a healthy diet, avoiding junk food and choosing a variety of vegetables, fruits, and whole grains in order to contribute the unwanted weight gain could help you in the prevention of stretch marks. During the teenage years, children tend to binge a lot of food which makes them increase their weight rapidly. Hence, the need is to control this rapid weight gain by certain stretching exercises in order to prevent stretch marks. Staying hydrated is important during the teenage years by having at least 8 glasses of water every day. This would not only prevent stretch marks but also make your skin plump and glowing. Keeping your skin moisturized using creams and lotions is important, which improve the elasticity of the skin. This also has an additional benefit of preventing itching caused due to the stretch marks. Applying creams and lotions at night prove to be more effective by increasing absorption, since the pores of the skin get opened only during the night time. avoiding the use of topical steroids can also help since these steroids could also lead to stretch marks. While stretch marks cannot completely go once you have them, there are ways to fade them to a great extent. applying the stretch marks creams and gels at night before going to sleep on the stretch marks, which could include Mederma cream, for stretch marks and scars, or cellex-C which stimulates collagen production and elasticity of the skin. the important thing is that teenagers should avoid tanning of the skin, this helps stretch marks to appear discolored against the skin. Thus, sunscreen of SPF 15 or higher should be applied regularly when in sun. massaging the affected area of the skin with essential Vitamin E oils, with a combination of almond and coconut oil, or aloe vera can be a good remedy for treating stretch marks during teen years. both the Cocoa and Shea butter are known to be the super products for hydrating the skin and can also boost smoothness and elasticity of the skin. This has no side effect on the teenager’s body but has to be used a couple of times a day. This may seem odd but many say this is the best treatment for stretch marks during teenage years, if one gains weight gradually during these years it can treat the stretch marks, by making skin elastic and supple. Stretch marks or striae, are the marks or lines on the skin that are often observed during pregnancy, sudden gain of weight and also during puberty in both boy and a girl. During puberty, the areas covered by stretch marks are belly, hips and chest or breast. Taking in the right balance diet, keeping the body hydrated both from inside and outside by regularly drinking water and applying moisturizers respectively can help a lot in stretch marks. Other ways include regular exercising, avoiding the use of topical steroids are known to be effective for the prevention of stretch marks. If one has already got stretch marks by applying stretch marks creams and gels, using sunscreen regularly and massaging with vitamin E rich oils or cocoa butter also helps. How to Remove Stretch Marks on Thighs?